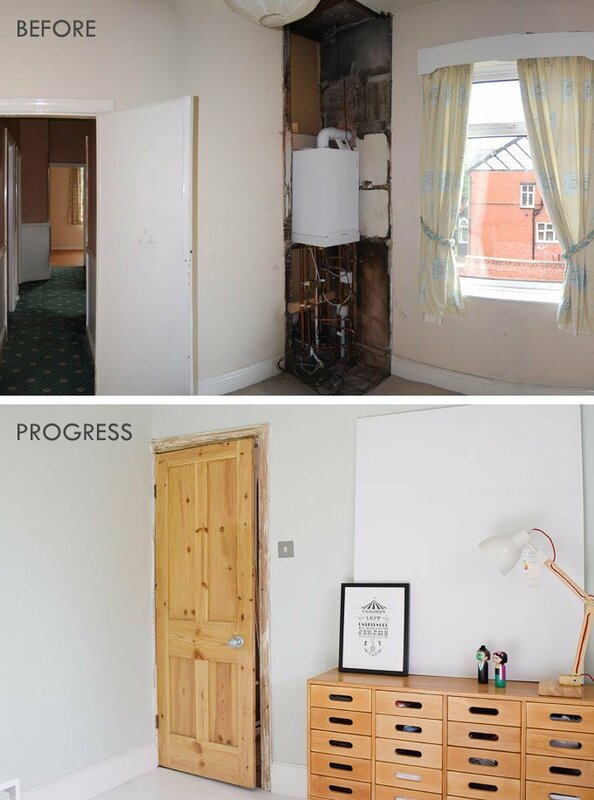 We’re so excited with the progress we’ve made in our fourth bedroom over the course of the year. The boiler that took up a huge chunk of the space has been moved into the cellar, we’ve had the roof repaired so that it no longer rains in through the ceiling (which we’ve repaired, too), had a new window installed, the whole room has been replastered – by me! (still can’t quite get over the fact that I did it), we’ve laid a new plywood floor and painted everywhere, too. Yep, we’ve managed to tick a lot of boxes and the space is definitely starting to look much more habitable. Now that most of the messy building work is out of the way, it’s time to start thinking about adding a bit of personality and personal touches to the room. Up till now, the only things in the room are a bed and the gorgeous sideboard that we managed to find at a local antiquey shop. I love minimalism, but even for me that’s a bit too sparse! One thing that the room definitely needs is more furniture. 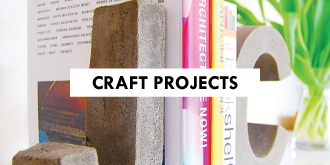 We’d like some shelving, some hooks on the wall (they can totally be classed as furniture, right?) as well as things like rugs and more lighting. 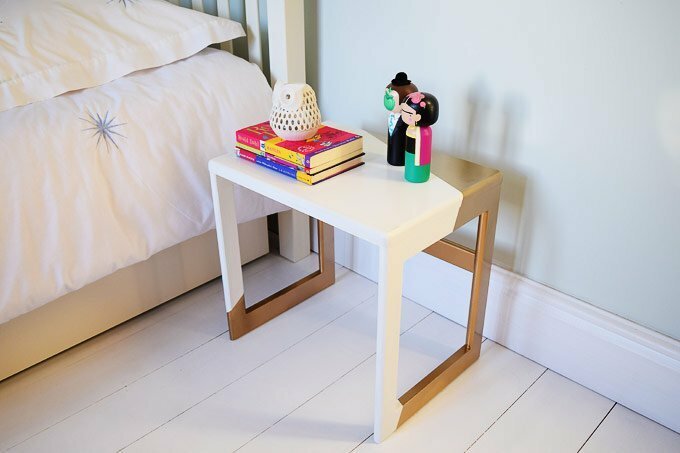 But one thing that we do now have is – drumroll please – a bedside table! 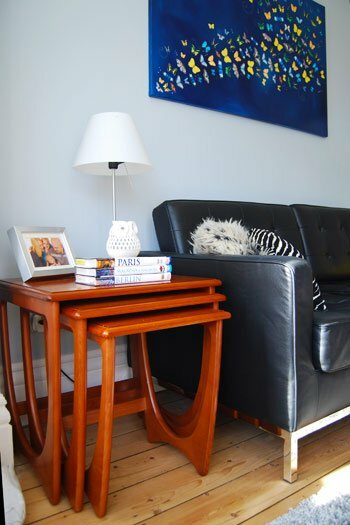 It’s actually one that we had leftover from a set of 3 teak tables that we bought a year ago when we made the magazine holder table that’s in our dining room. 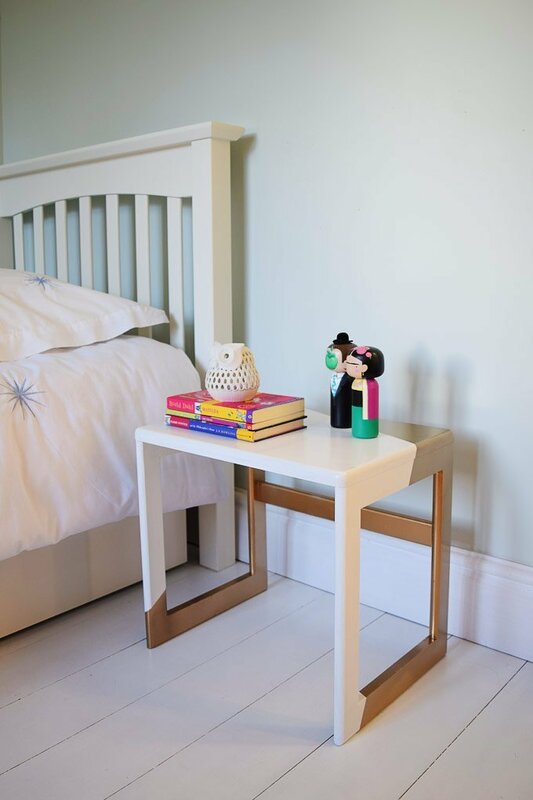 We used the large table to make the magazine holder, gave the middle table (which was still in a good condition) to a charity shop and this small one that we had left seemed perfect for the guest bedroom. We actually liked the teak table as it was and would have left it in its natural state, but it was quite scuffed and damaged so we decided to give it a quick coat of paint instead. It doesn’t matter what kind of furniture you’re painting, the steps are always pretty much the same. 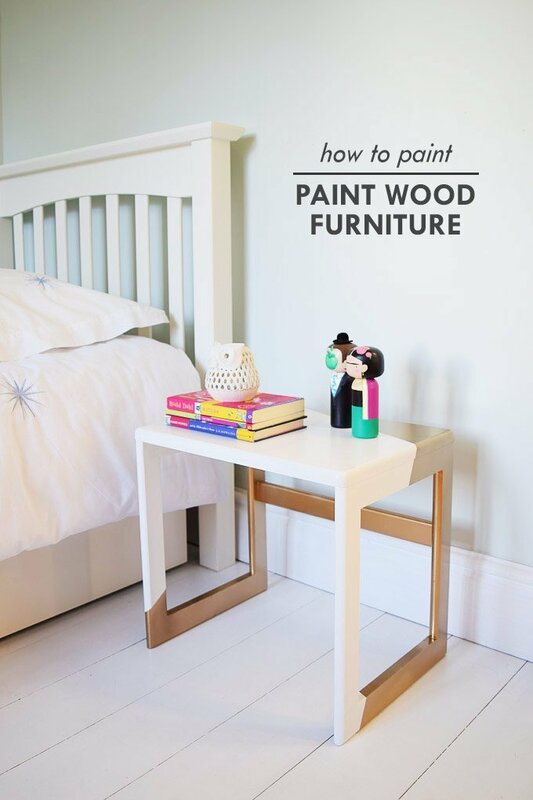 We already shared our guide on how to refresh wooden furniture, we thought that it’s about time that we shared a guide on how to paint wood furniture, too. Preparation is everything when painting and no matter how well you paint, if the surface isn’t prepared well, you’ll probably never achieve a finish you’ll be happy with. 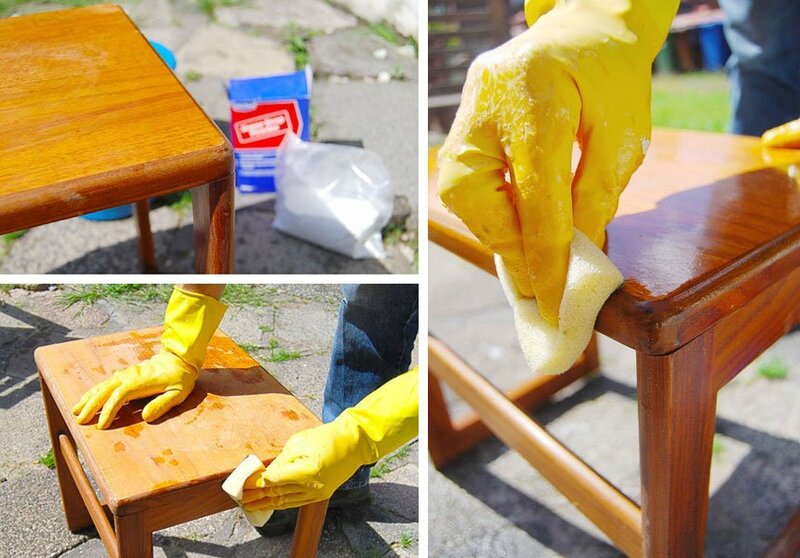 Before doing anything else clean your furniture. It’s likely that old furniture has been waxed or polished as some point. It’s important to get rid of all residue and dirt before you start painting, as any grease or dirt will stop your paint adhering. We always use sugar soap for this. 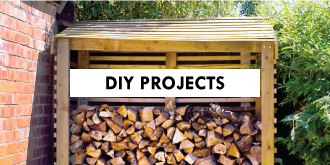 It’s cheap and works fantastically well in removing all grime from the wood. When it’s dry, check for any repairs you may have to make and fill any holes or dents. Don’t panic, we don’t mean hour upon hour of sanding, just a quick rub down. You can do it by hand, or if you’re lazy like us, you can use a sander. We always use 120 grit paper for this step – be gentle. You’re essentially making thousands of little scratches in the wood (which pretty much invisible to the eye) that your paint can stick to. Then clean away and dust before moving onto the next step. 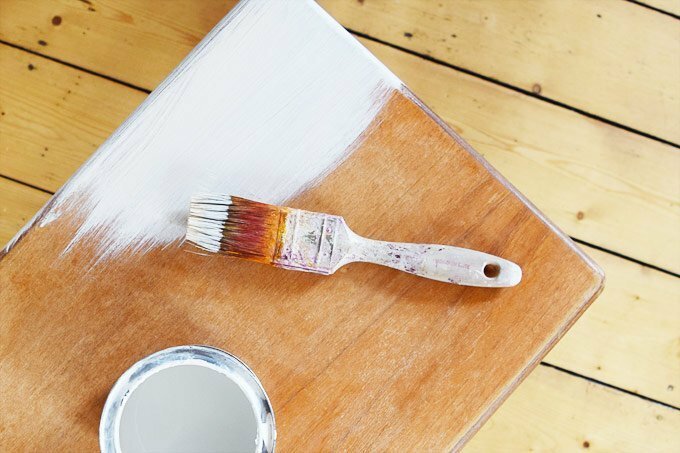 Priming is essential for making sure that the overall finish is more durable and it should also ensure that no stains will come through your finished paint. 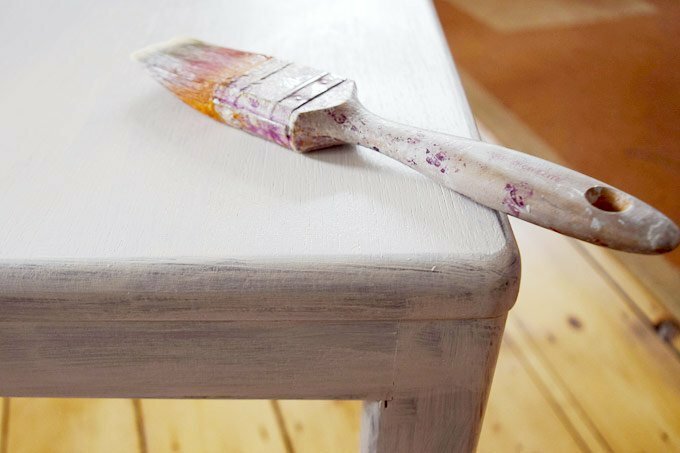 Use a paintbrush (you can use a roller if you prefer) apply an even coat of primer all over the piece of furniture and let it dry completely. We used Farrow & Ball Wood Floor Primer & Undercoat which we had left over from painting our plywood floor. This is a crucial step that most people skip, but it’s essential if you want a good finish. When the primer has completely dried, give the piece of furniture a very light sand (definitely per hand this time) with some fine (we use 240 grit) sandpaper. By doing this, you will remove any little bumps or air bubbles that will inevitably have developed on the surface. When everything is completely smooth, give your piece of furniture a wipe down with a soft cloth. Now it’s time to get out your paintbrush again. Apply an even coat of paint all over your furniture. To get the best possible finish, it’s best to apply a lot of thin coats of paint. Never try to cover your furniture in just one coat of paint, as you’ll never achieve a good finish. 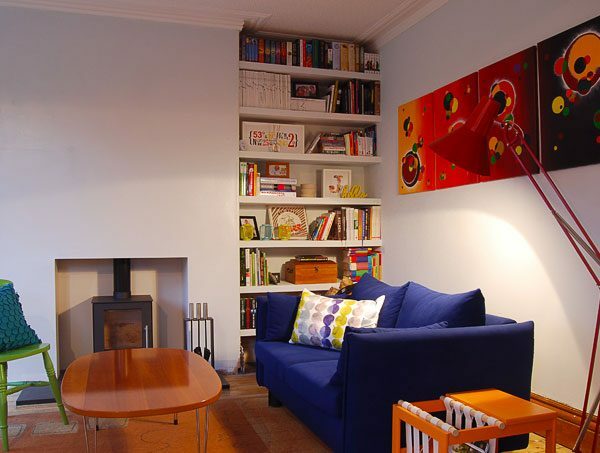 We used Farrow & Ball All White Floor paint (which we also had left from painting our floor). When the first coat of paint has completely dried, give the whole piece of furniture another sand with fine sandpaper (again around 240 grit). You’ll again be making scratches for the next layer of paint to stick to, but as before you’ll also be removing any lumps and bumps. 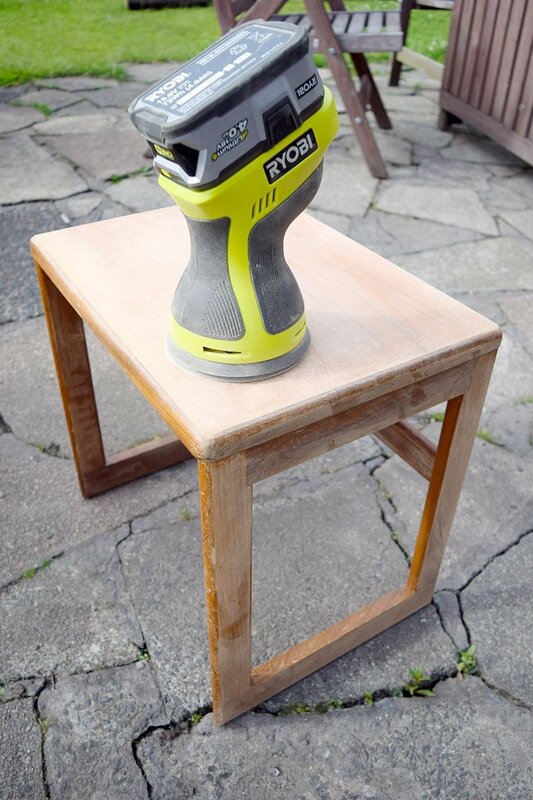 Remove any dirt and dust the sanding has created. 7. Paint. Sand. Clean. Repeat. 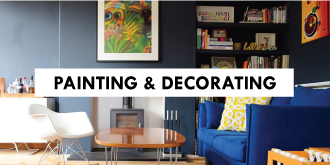 Now it’s time to give your furniture another coat of paint. 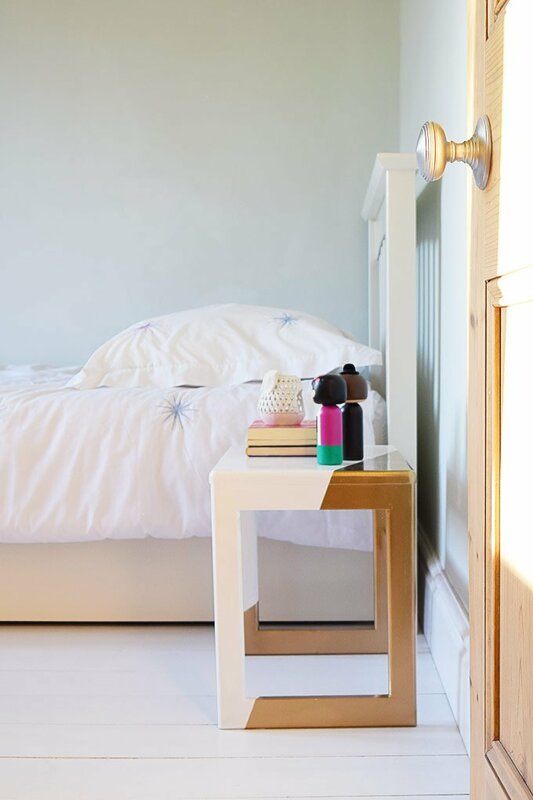 If the paint still doesn’t cover your furniture completely, don’t try to apply a thicker coat of paint, but instead repeat steps 5 to 7 again until you’re happy with the coverage. 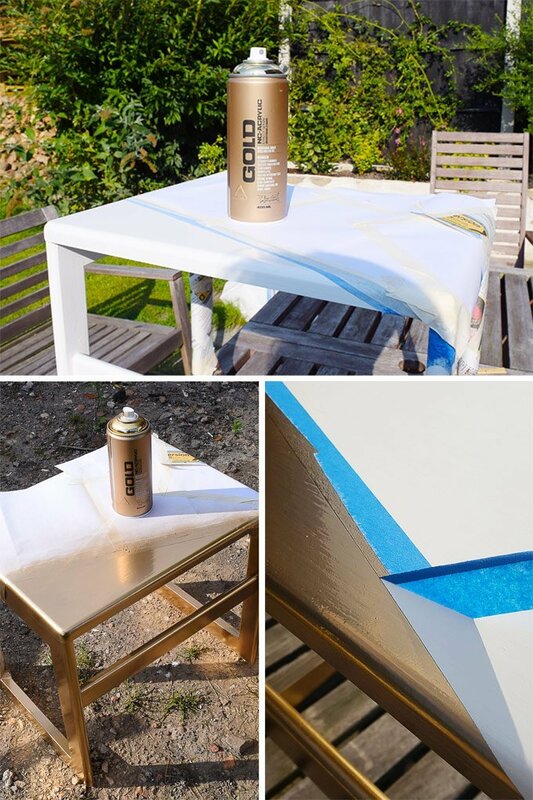 We thought that it would be fun to add a bit of interest to the table and decided to get a bit creative with a can of spray paint. We just taped off the area that we wanted to be gold with some masking tape and newspaper and gave it a few coats of gold paint. As when painting, always apply lots of thin coats instead trying to cover it in one thick one. It’ll give you a more even finish and avoid drips.
. It really is super shiny & gold and it’s definitely the best gold spray paint that we’ve ever used! 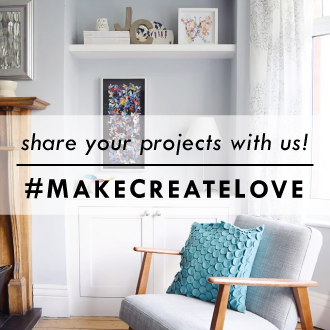 Adding personal touches and items to a room are essential in actually making it come together and feel like a space that you would want to spend time in. We still have a long way to go, but it’s definitely starting to feel like a more finished room. 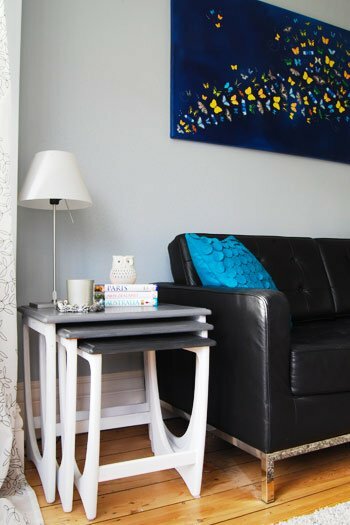 Have you ever painted furniture? Do you have a favourite spray paint? Love this, looks very good something I’d buy in a shop for sure. This is a great painting guide, thanks for sharing! I’m going to show my wife this when I get home. We’re going to repaint some items in our home. Therefore, it’s quite fortuitous that I came upon this. What color of paint is your favorite? Thanks Johnson. For interior woodwork we like to use waterbased paint and for exterior woodwork we will always use oilbased paint. 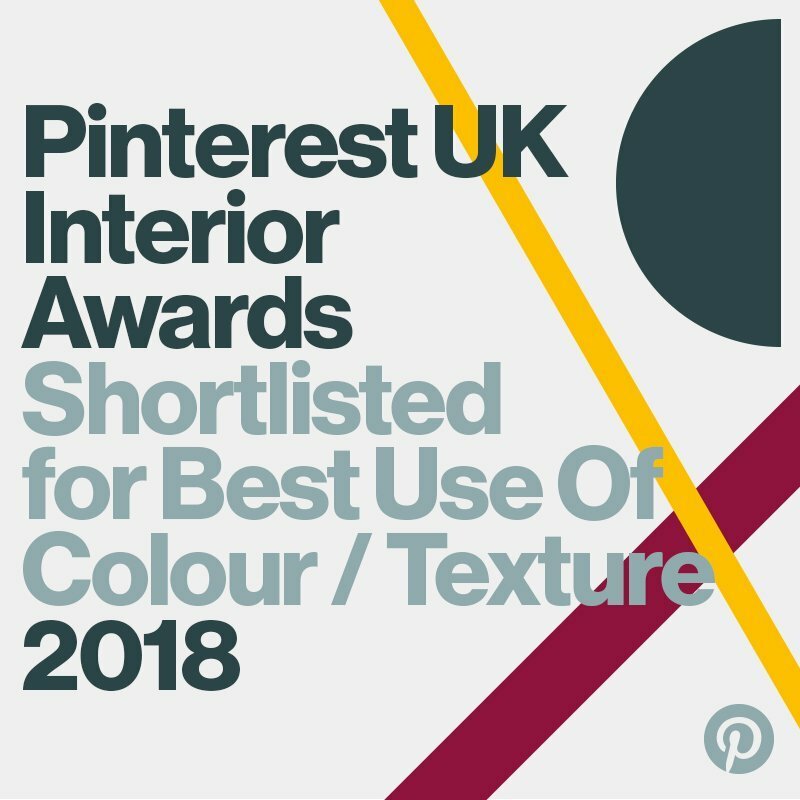 Looks gorgeous (and great tips for painting furniture) – I love the geometric gold element, so clever! Thanks Molly! We’re really happy with how it turned out, too! 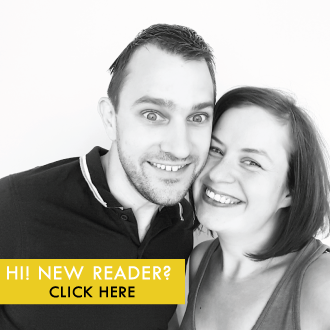 I’ve recently come across your blog and now following along. You’ve got some great ideas and tips. Will forward this post to my son as he’s looking for ideas for his room. Hi I’m trying to paint my dark mango wood . I just want to brighten it up a little like speckles of gold… spray paint work? 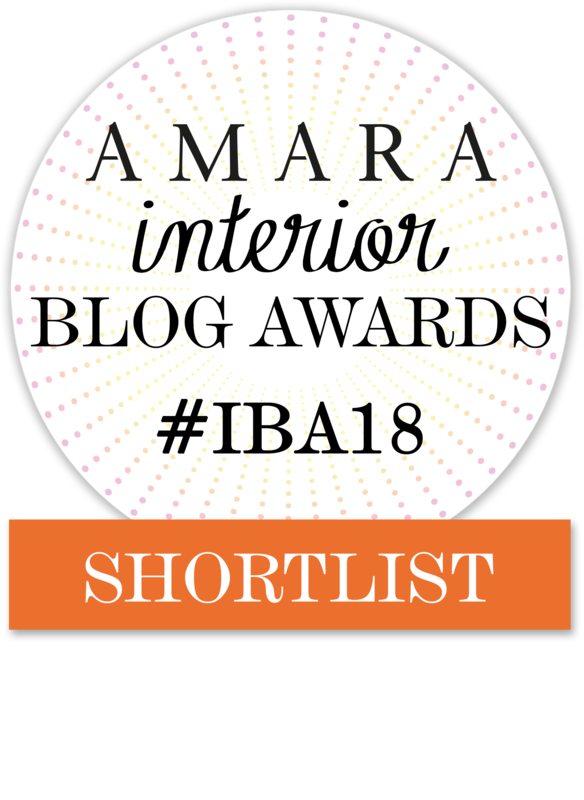 I’ve never painted mango wood before – sounds lovely, Sheba! If you only want small speckles I wonder if something like the good old fashioned sieve & toothbrush speckle method with some gold paint would work best? I think it may be difficult to achieve little speckles with spray paint. My initial thought was “why would you ever paint teak?” but then I saw the original state of the table and, yeah, definite improvement. It was an ok looking table before but now looks really terrific! Great job you two. Thanks Susan – glad you like it! We would have been more than happy to keep the table unpainted, but it was sadly just too damaged to salvage. You’re very welcome Lucy! 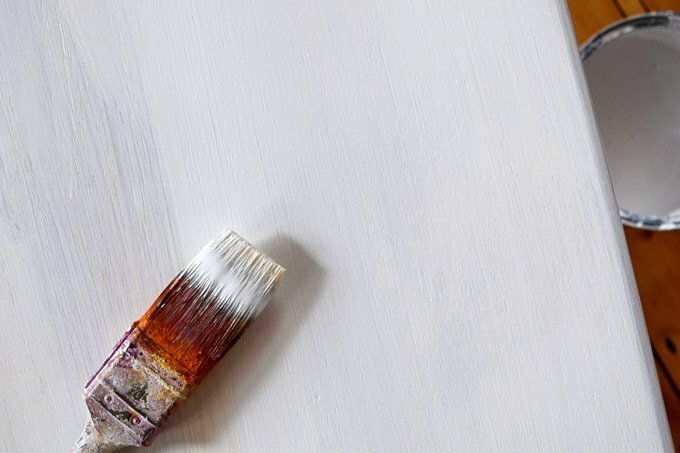 You can still lightly sand the last layer of paint – just very lightly. It will still make everything much smoother. I was wondering if I can do something like this for a outdoors. I wonder if I can use some water resistant protection before I apply paint. And I’m a fan of spray color I would not use brush, or is it some technical must do before you spray it? The diagonal golden spray is an absolute hit for me, love it! Thank so much, I’ll ask at the local store about the spray and what they can recommend for outdoors. To spray small pieces where you don’t want spray to cover everything in sight. I bought a fold up washing basket and garment protection bag both from £Land. Unfold wash basket, cover with garment bag and place items inside. For larger items I’ve joined more wash baskets together (remove one side of 1st & each subsequent wash basket and secure until required size, I use green covered fine garden wire which twists) and cover with tarpaulin also from £Land. 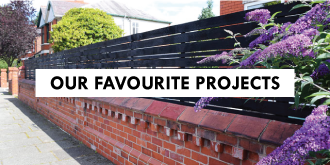 That’s a great idea – thanks for sharing it Lucy! This really useful. I have an oak sideboard from a large chain furniture shop. Do you think this method would be ok for that? I am sure it must have all been treated with something but presumably the sanding and priming gets around that? Yep, it should work for pretty much any type of wood, Nicola! Sanding is the key to everything both before priming and painting and in between coats!